Is it an oat biscuit? Is it an oat meal cookie? An oats health bar or an oat crunchie? Maybe it is all of the above. The Australians call this classic from my childhood, Anzac biscuits, but in South Africa, it is popularly known as hawermoutkoekies. 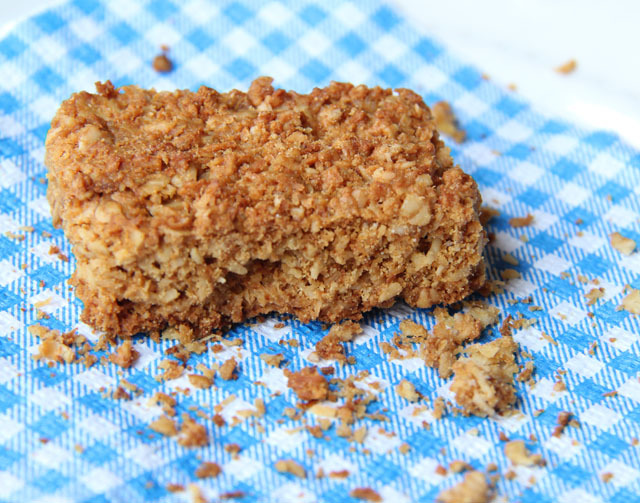 Hawermoutkoekie or oat crunchie or oat meal biscuit. These quick and easy oat crunchies were always in my mom’s cookie tin. She always baked them for our Christmas holiday in Herold’s Bay. I could never resist the temptation to sneak out a few crunchies. 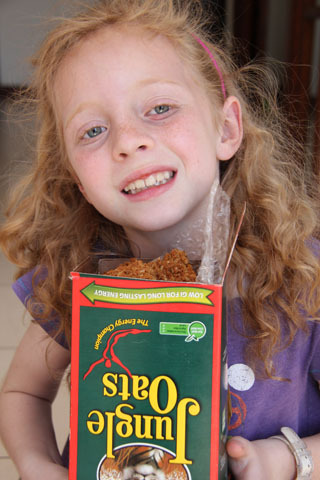 The kids are spoiled with a carefully packed Jungle Oats box filled with hawermoutkoekies. Nowadays she spoils my children with a carefully packed Jungle Oats box, filled with these healthy treats, when she bids them farewell after a visit to Cape Town. I always welcome this wholesome gift. My kids love it as a treat in their lunch boxes. And I enjoy it dunked in a cup of my favourite brew (without any guilty feelings…..). The bonus of these crunchies, is the crumbs left in the cookie tin, when everyone had their share. I use the leftover crumbs like granola. It gives a lovely (and sinful!) crunch to my breakfast of fruit and yoghurt. 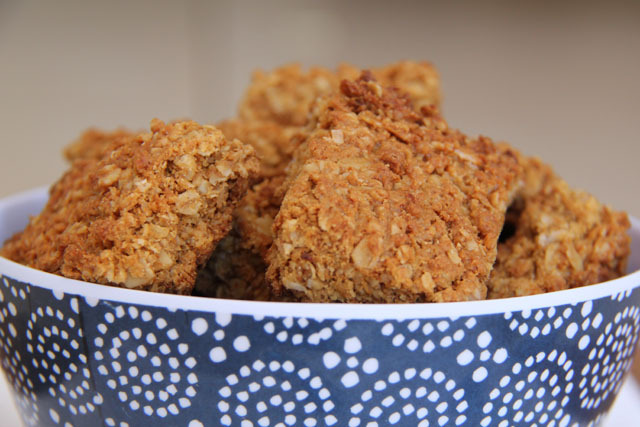 There are many recipes for hawermoutkoekies or oat crunchies similar to my mother’s. What makes her recipe unique, though, is the lemon zest and lemon essence. To me the lemon adds another dimension and freshness to the taste! Why don’t you try it and tell me if you agree. In a large mixing bowl, mix all the dry ingredients and lemon peel. Heat butter in a small pot and when melted, add the golden syrup. When the butter is bubbling, add bicarbonate soda and stir through. Add this to the dry ingredients and stir in by hand. Stir in beaten egg and add lemon essence. Gently press the crunchie mixture in the greased baking trays. Remove from oven after 15 minutes and cut in squares with a bread knife. Return to oven and bake for a further 5 minutes. Make sure that you include these in your holiday cookie tin for a quick and healthy snack! My nou skoon honger gelees aan die lekker eetgoed. Jou Block is pragtig. Geniet die skryf werk en foto’s. Groete. A.
Dankie vir jou ondersteuning! As they say in the movies: “watch this space!”. ← Melkkos – traditional or with a modern twist?